I was raised in Virginia and lived most summers in the hills and hollows of the Blue Ridge Mountains in Tennessee. I have an avid appreciation of all things handmade and all things used to make things by hand. As well, I love decorating with everything and finding different uses for all things old. You only have to browse some of my archives here and find the pleasures I receive in country living. Pictured above is a group of blue pottery. These pieces are all made by hand. 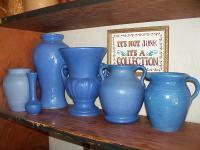 Made by different potters, but grouped together they make a sweet collection for lovers of blue decor. These pieces can be mixed with other colors for a wonderful French Country look. I've used these to hide away gum, lollipops, loose change and those things you can't find a place for when they are lying around. You know...twist ties, paperclips, pins, and stamps. And of course...flowers!!! 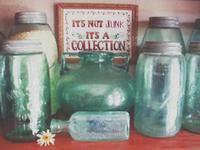 I particularly like antique mason jars. In these are stored macaroni, dried beans, and loose tea. 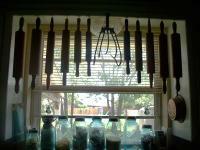 I have these in various places in my kitchen decor. To the right is one with herb teabags stored next to a couple of my teapots.